An open curtain as the audience entered revealed a pristine dinner table and impressive chandelier. The background music put us at ease and all seemed set for a pleasant evening, but appearances can be deceptive and we were in fact voyeuristic guests at the dinner party from hell. We discover that he has been hired from an obscure website and wonder quite exactly what his services extend to when Paige hands him an envelope stuffed with money as his upfront payment. After this moment of absolute control, on the entry of her husband Lars, Paige descends into An anxious state awaiting the arrival of her guests. Lars (a laid back Andy Rowe) is in contrast more chilled out than the copious wine that ﬂows freely throughout the evening. Perhaps this is due to his philosophy of following his "psyche-drive" the espousal of which via his book “Beyond Belief" has won him popular acclaim and its success is the reason for this dinner party. run off with a younger model, which puts her seating plan out of sync. Lars however moons over Wynne, an old ﬂame from university, who has read, reread and inwardly digested his book, now putting his ideas into practice, particularly when deﬂecting "negative inﬂuxions”. Last ofﬁcial guests to arrive are molecular biologist Hal (Matt Fell in an obviously forced jovial mode) with his new wife, "news-babe" and "sexpot" Sian (a gloriously snooty Katy Corrie) who have already discovered the best way to wind each other up and bring a frosty atmosphere with them, alongside the obligatory bottle of wine. 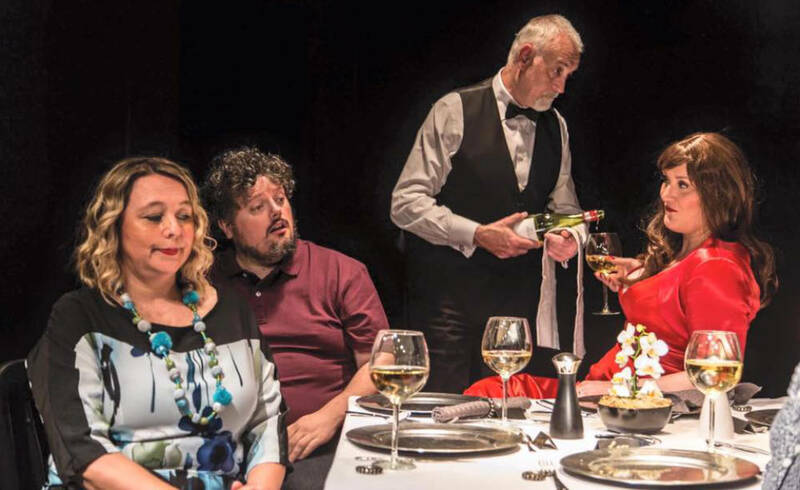 Before the food is served, however, there is a ring on the doorbell and the waiter ushers in a bloodied stranger (convincing liar Mike, played by Chris East) who has crashed his van into a ditch in the fog and wants to borrow their phone to call his breakdown company. Paige is determined to have him frogmarched out of her home but Lars insists he should be welcomed and, since he'll obviously have to wait some time for the rescue service and considering there's an empty seat, invites him to join them for dinner. All the elements are now in place, with slight adjustments, for Paige's highly choreographed dinner party to begin. 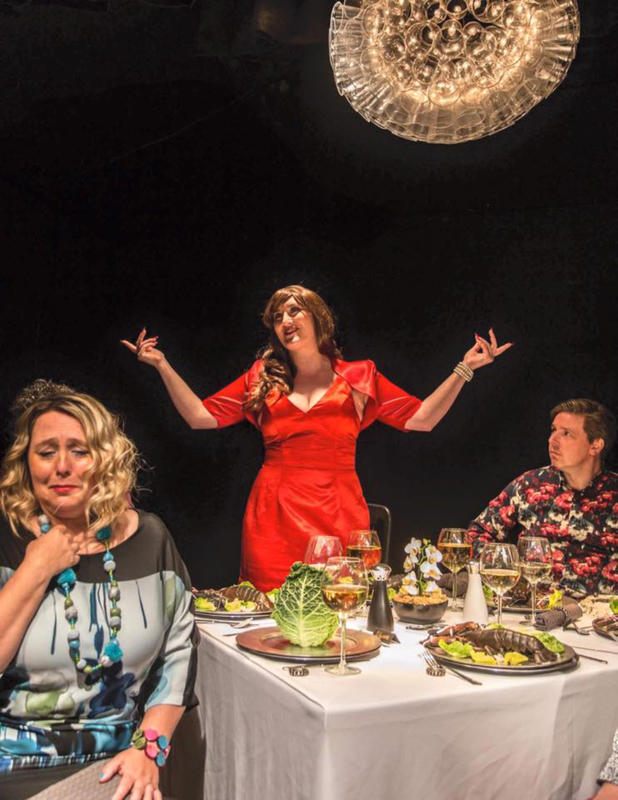 As the various courses; "Primordial Soup", "Apocalypse of Lobster” and "Frozen Waste" arrive and the glasses are constantly reﬁlled the characters are forced into revelations, culminating in Paige's instruction to the waiter to carry out the ﬁnal part of her orchestrations. 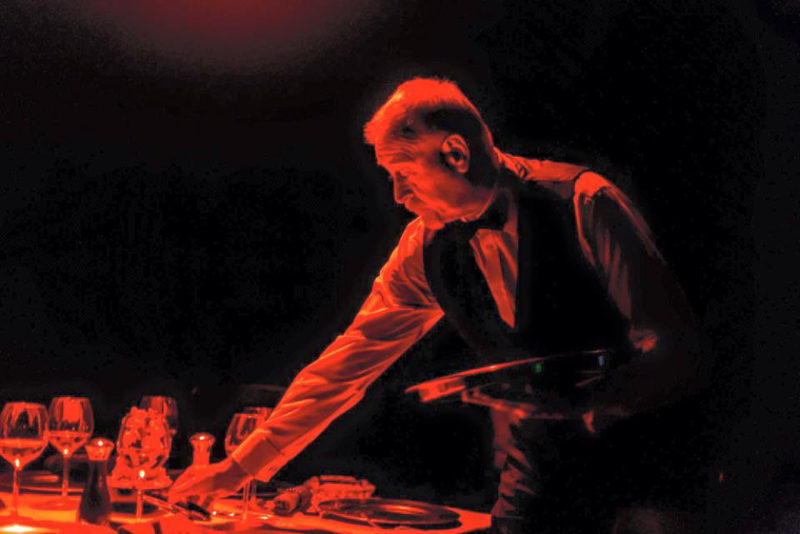 His one line, explaining that he only takes the wages of a waiter, closed the play in a suitably mysterious manner. Full of black comedy, such as the moment we discover that it was actually Hal whose car ran Wynne off the road, and a sense of menace, engendered particularly in the scene changes when the chandelier turned red and an ominous drone sounded, this was a slick and stylish production well played by all and deftly directed by Tamsyn Payne, not easy when the main action of the play consists of six guests sitting round a dinner table. Another triumph in a great season of plays presented by Masque. An artist, a scientist and a sexpot are coming to dinner. Paige, hostess extraordinaire, is celebrating the publication of her husband's bestseller. The arrival of Mike, marooned in the foggy lane after crashing his van, provides an unexpected addition to the evening's entertainment. Primordial Soup is the first on the menu – let the dinner from hell begin. Masque Theatre's production is directed by Tamsyn Payne, whose shows for the group include Arsenic & Old Lace (2014), Les Liaisons Dangereuses (2007), Dying For It (2010) and Arabian Nights (2012).